I am a classical person, cooking on fire. From the beginning of my enthusiasm on cooking, I only cook on fire. Classic cooktop with natural gas burner. I couldn't imagine any other cooktop other than that. Not until I went into University and started to observed my friend mini single cooktop using electric. The first one I tried to use was the normal electric burner with that coil that turn red and you can cook on that. Then came another new way of cooking which is induction cooker. A single cooktop that most college student would love to have so they can cook their meal without going to spend a lot in college cafe. When I was in district posting, our group brought that induction cooker with us so that we can cook our dinner. We were staying quit far away from town and the nearest cafe or restaurant only open until 5 pm. 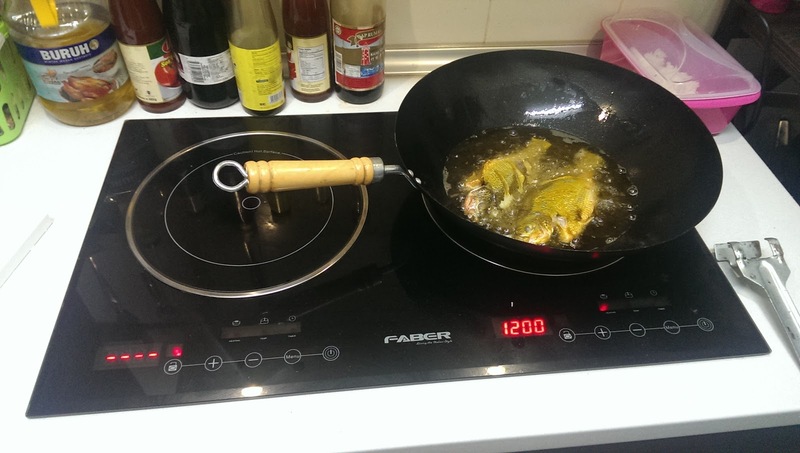 Thus, the induction cooker save us a lot of time and money. During that time, I was exposed to this concept of cooking on induction. Years after that, already a medical officer, served my time in district and then here I am back in the city, living in my own apartment with my family, the first thing that came to my mind, which cooktop should we use. Gas. That's my answer because I never had any experience with other kind of cooker. However, my mom had been tricked by a sales person, year ago, about this vip membership, where you register and later get a lot of benefit but before that you need to buy a product -kind of scam. She paid almost RM3000 for an full set induction cooker, with 4 kind of pan and pots, and a vacuum cleaner. The scam was made by this company called Home E-tech. Or something like that. Now called Aowa or something like that. Thus this induction cooker she had, was there for 2 years and nobody use it. When I move to this new apartment of mind, I grab that induction cooker and install it in my kitchen cabinet. It look modern and classy. However, after 2 weeks, that induction cooker was broken. Out of frustration, I had to find another new one, mainly because my kitchen cabinet were unable to support gas burner, too small and the design was meant for induction cooker. Had to buy a new one. Cost me around RM1000 comapare to maybe Rm100 for a normal gas burner. So, does induction cooker good? Does it worth to use? If you asked me, after 2 month using it, it was not bad at all. I can cook like how I cook on a normal stove, but this time I have to be more focus because the heat generated by this induction method are so efficient it can burn your food quickly. So keep in mind, you do not need to wait hald a minute because your pan will be very hot in seconds. I like that. My cooking time reduced by almost 80%. To boil pot of water for instant noodle, only took around 30-40 seconds to boil. I have this small kitchen where every time I cook using gas burner ( I used gas before they finish installing my Kitchen Cabinet), I would like I would sweat in a gym after 1 hour of heavy cardio. I feel like fainting with the heat generated by the fire on a gas burner. But using induction cooker, the heat generated or wasted to the surrounding environment is very small. I feel much more comfortable cooking and I did not need to leave my kitchen on and off to inhaled a fresh cool air in the living room before continue cooking again. I can stand for 2 hours straight cooking and preparing dish with induction cooker. Not only kitchen, even the pot. You try boiling water in a pot. After the water boiled, would you dare touching the top of the pot with bare hand? No. It's hot. With induction cooker, you can do that. The heat was so focus on the bottom of the pot only the bottom and the contain of the pot get hot, the rest remain cool. It was like, magic. (Do not touch the induction hob right away after cooking though, the heat from the food and bottom of the pan or pot can still remain there for few minutes before disappearing. A tips, do not turn off the induction hob power right after cooking to make sure the ventilation fan at the bottom continue working to cool it down and if possible do not remove the pot straight away from the hob, the remaining heat can be transferred to the pot and help the top of the hob to cool down much faster. No hassle to buy gas. Have you ever need to cook something at night and then you are running out of gas. Living in KK it is not that difficult to go and find a new gas even at night, but still, you need to bring that 14kg gas cylinder down the elevator, drive outside, then bring back the more heavier filled cylinders up to your apartment. However, some say that if electricity went off, at least you can cook with gas burner but not electric hob like induction cooker. I answer, who want to cook with no electricity. Would you rather eat outside or cook in the dark or hot sunny afternoon without electric in your house? I would go out and eat in a mall with air conditioner. It does not cost that much (surprisingly) with induction cooker. As said, the heat generation is so efficient, your cooking time is shorter and your bills will get maybe RM10-15 higher than average. A gas cylinder cost you around RM28.50 - RM30 ( I wonder, did government said they want to reduce the price?). The net cost is still the same using induction or gas burner. Using gas burner, you need to make sure you did not forget to turn it off, sometime you forgot, your pot melted and the next thing you realise, your house is on fire. With induction cooker, you can set time for your cooking, and if you forgot to turn it off, the next thing that can happen is, your induction get overheat and shut down by itself. You will have a headache on how to repair it later but at least your house is safe. The temperature also can be set so if you set it at 120 degree for example, it won't go above this so risk of the pot melting is lower than gas burner. This is what make people refused to use induction. You go to any shop, all the induction cooking pot and pans cost more than RM200 each. Scary. However, do not get fooled by that. That is the tactic of some company to sell their product at higher price. Read the science behind it. Induction use magnet to work. Thus any pan that have some sort of metal inside it can be used on induction hob. The most famous metal is Fe or iron. All iron base pot and pans can be use on induction cooker. However, so thus steel. Aluminium steel, carbon steel, also can be used with induction. This kind of pan or pot cost way cheaper than iron base pan such as iron cast pan. Go and bring a small magnet when you shop and test it on the pan you want to buy. If the magnet stick, then it can be used. As for now, I have used an aluminium pot ( aluminium steel that does not contain nylon inside it. Some manufacturer mix nylon or plastic so that they can sell the thing cheaper). Aluminium steel pot cost around Rm30-50.Way cheaper than that RM200-RM300 pan you saw in the luxury kitchen shop. The next thing is carbon steel. This is the cheapest among all. A 24 inch carbon steel wok only cost me Rm20. It work perfectly on induction hob. In conclusion, induction cooker is not bad at all, it's not expensive, it's clean and cool. What more do you want? If you ever had a thought on buying induction cooker, do buy and try it. I have nothing to regret after using it for 2 months. Frying a fish using my Rm20 carbon steel wok. Fast and furious...haha. Look at all the stuff I put near the hob,, if it is a gas hob, that sauce, and other thing would be spoiled. With induction, the heat only focus on the pan. Thus you can even put a butter beside the hob and it won't get melt. I am using Faber brand. I think with the increasingly strong advances in technology, the induction cooker large still dominate when cooking. Read more. Induction cooktop helps reducing the time of cooking and saves energy too. Therefore, I liked visiting Jojoshouse.com to read more about different brands and models of induction cooktops that are popularly available in the market.